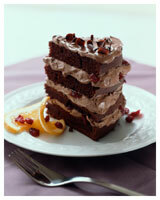 Try this chocolate mousse cake and have everyone guessing if it's homebaked or fresh from your bakery! The idea of baking a chocolate mousse cake may sound daunting to a more novice baker. But if you really want to knock the socks off someone and "WOW" them with your baking abilities...then try this recipe. What's so cool about any baking endeavor is that it's all about following instructions, right? So read through this recipe once, gather up all the ingredients and bowls and mixers and then just work throught the instructions step by step. 1. Preheat oven to 300° F (150° C). 2. Combine flour, baking powder and salt in a bowl and set aside. 3. In a separate bowl, beat eggs and gradually add the sugar. Blend well after each addition. Add the lemon juice. 4. Heat the milk without boiling it. 5. Add the dry ingredients to the beaten egg mixture in four stages. Pour the heated milk directly into the batter and stir well. 6. Pour the batter into a round 8-inch unbuttered cake pan. Bake for 25 minutes or until done. Remove form the oven and let stand to cool on a wire rack. 7. Once cooled, slice horizontally to make 3 layers. 1. Melt the chocolate squares with 3 tablespoons water in the top of a double boiler. 2. Add the sugar and stir. Remove from heat and let stand to cool. 3. Add unbeaten egg and stir well. 5. In a separate bowl, beat the egg whites until stiff peaks form. 6. Add the whipped cream to the chocolate mixture, then fold in the egg whites. 7. Spread between each cake layer and on top and sides of cake.